Massive mobilization of Venezuelans in support of President Nicolás Maduro and the Bolivarian Revolution. Today, in Caracas. To copy is the fist step to learn the skills you need to innovate. The blame on #FreeSoftware forkers is a Capitalism things. In fact you can distinguish a Free Software from an #OpenSource one by announcing to the developers you have forked the project and see their reaction: if they are happy, curious and supportive it's Free Software, otherwise their focus on their market share will show it's open source (a #marketing tool). I tooted an idea a while back on an #ActivityPub federated #Podcasting app. Well I found a project called #PubCast. All there is is a Github page some code that doesn't actually work yet but I love the fact that it's being worked on. Expanding on my idea, they should add support for #WebTorrent too. Wouldn't it be awesome if anyone could setup their own podcast site and then people could follow via the #Fediverse or #RSS and stream via webtorrent so a popular show doesn't bring down their site? "My blog, deleted two months ago by WordPress, is back! And here is my first post on the new version of the site. Please share! #911truth #internetcensorship http://truthandshadows.com/2019/01/09/thought-crimes-truth-and-shadows/ "
Just a friendly reminder to always add an image description for images you upload in the fediverse! In the Mastodon interface, just tap on the image again after you upload it, and you'll see an option to add a description. Write the important information about the meaning and purpose of the image, not just its visual descriptors. Interesting writeup on the stuff that runs silently in the GPU on the Pi, and how to look at the throttling it's doing. @xj9 Ugh. #goals I'd love to hear more about your base camp. I've been chatting with the people behind futel ( http://futel.net/about/ free phone ) which might be of interest to you. 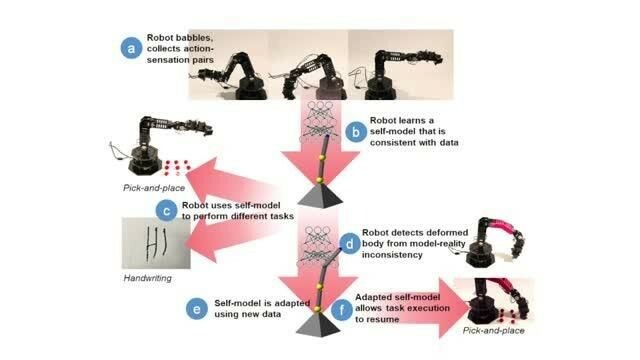 Columbia Engineers have created a robot that learns what it is, with zero prior knowledge of physics, geometry, or motor dynamics. Initially the robot has no clue what its shape is. [W]ithin about a day... the robot creates a self-simulation, which it can then use to contemplate and adapt to different situations, handling new tasks as well as detecting and repairing damage in its body. The more I learn about git-annex, the more awesome I realize it is. They do a pretty lousy job of marketing it, though, because rather than saying "It's like SyncThing only way more awesome because it uses real version control" they talk about all the different things people use it for. Oh, also, it uses Tor as a way to enable roaming and firewall traversal rather than anonymity. I think more stuff should use Tor this way. I may add it to DeskControl. US says some guy named Juan is now president of Venezuela.